Below are cowboy, Western, or country designs on paper plates for sale. These plates are perfect for a wide variety of occasions from birthdays, anniversaries, weddings, and more. They are for sale from Zazzle, Amazon, and eBay. When ordering, please note the paper plates from Zazzle can often be personalized, while the ones from Amazon and eBay usually cannot (but the still offer some great plates!). Below: Cowboy / rodeo paper plates with a vintage design from Zazzle. Below are Western and cowboy designs on paper plates for sale on Zazzle. Zazzle Tip #1: On Zazzle, many of the paper plates can be easily personalized. In the previews below look for plates with text on them. Then, after clicking through to the Zazzle website, look to the right of the main image preview for the personalization option. Zazzle Tip #2: On Zazzle, many of the paper plates are available in more than one size. When on the Zazzle website, look to the right of the main image preview for this option. Zazzle Tip #3: The cowboy paper plates on Zazzle can have realistic looking cowboy or Western designs on them that look like they include leather, lace, or other materials. However, all the design elements on paper plates on Zazzle are printed. While Amazon often has an excellent selection of paper plates with cowboy or Western designs, they usually are not customizable. Like Amazon, eBay often has an excellent selection of paper plates with cowboy or Western designs but they usually are not customizable. The right design on a paper plate is a simple, easy, way to add the right touch to any gathering. Cowboy or Western designs can help lend the right mood to a variety of get-togethers from baby and wedding showers, to weddings, birthday and anniversary parties and more. They also make fun collectibles to commemorate an event, especially if you have had the plates personalized (which can often be done on Zazzle). Make sure you double-check that you're getting the right size. 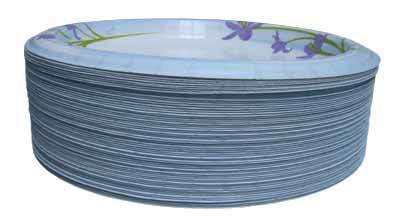 Many sellers offer paper plates in different sizes and it's easy to order the wrong size. Make sure you know how many you're getting. Paper plates usually come in sets, but the number of plates in a set can vary. Below: A stack of (somewhat boring) paper plates.